Whether you love kids or can’t stand them (and their overprotective or scarily absentee) parents, you’re going to do a rotation in pediatrics during your third year of medical school. I had a blast on my rotation and learned a lot. There is a TON of information to know for the pediatrics shelf exam; it is a hard test. It is important that you start studying early for the pediatrics shelf and stay organized with your resources. A solid question bank like UWorld is a good resource. However, most students will say that it is an insufficient resource to do well on the shelf. We recommend using BRS Pediatrics as a backbone text and PreTest Pediatrics as a secondary source of practice questions. These are pretty clearly the best pediatrics books for medical students. Using these three resources, you will be well prepared for the pediatrics shelf exam and for the wards. BRS Pediatrics is the go-to book for your core pediatrics rotation. This book covers every aspect of information you will need during your rotation and for the shelf and a little bit more. The book is well-organized: sections are divided by discipline of medicine (e.g., cardiology, orthopedics, emergency medicine, etc). This is in contrast to a resource like Case Files that is divided by case, but is difficult to navigate in terms of type of content. In sum, BRS Pediatrics’ organization and comprehensiveness makes it one of the best pediatrics books for medical students. We recommend starting to read this book from day one. It is easy to read, but it is not a short book. Getting started early will help you get through it in the first couple weeks of your clerkship. The kicker about this book is that is contains 400 NBME-styled questions in the back. They are high-yield and help reinforce information from the chapters. Hammer out these questions while reading the book and then do UWorld. There are a couple downsides to this book. First, it is relatively old (from 2004). However, this is largely a non-issue since the information covered on the shelf is well-known and not cutting-edge.Your use of UWorld will fill in any high-yield information that may be newer. Also, the book unfortunately does not have any pictures. Again, UWorld will be helpful for anything high-yield (e.g., viral exanthems) and you will get exposed to important visual information on the wards and by reading up on your patients. In summary, if you buy one resource for pediatrics, BRS Pediatrics should be it. Since the Pediatrics shelf is such an expansive exam, we recommend that you tackle more questions than just what is on UWorld. 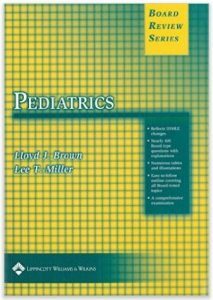 PreTest Pediatrics is an excellent pediatrics book for medical students. It is the best secondary source of questions for the pediatrics shelf exam. This book contains 500 NBME-style multiple choice questions. It covers a lot of information. The questions also tend to be more difficult than what you will see on the exam. There are some picky questions that cover more esoteric information. That said, if you cover all of UWorld and PreTest, you will be very well prepared to perform on the pediatrics shelf exam. The book is organized by organ system. My advice would be to try to match up the questions you do in this question bank along with the type of patients you are following on your clerkship in order to better remember the information. For example, if your patient has congenital heart disease, then do the cardiovascular questions when you’re studying. If you can’t finish both UWorld and PreTest due to time constraints, make sure you finish UWorld first, as this is the best question-based resource for this exam. Although the two books above are our recommended pediatrics books for medical students, there are other books out there that you can consider. The Case Files series makes a book for the pediatrics clerkship. This may be a good option for you if you like to read in a case-based format. It also contains relevant NBME-styled questions on the exam. It is also a shorter book than BRS so may be helpful if you are short on time. However, as previously mentioned, the book is not as well-organized and comprehensive as BRS Pediatrics. 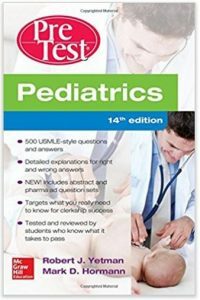 If you are looking for other ideas for question books, there is Shelf-Life Pediatrics and Lange Q&A Pediatrics; however, UWorld, BRS Pediatrics and PreTest are the best sources of questions and will probably be more than enough questions to get through during your rotation. Finally, be aware that the pediatrics shelf will likely have a couple questions on inborn errors of metabolism and genetic syndromes. These are covered in UWorld, PreTest and BRS Pediatrics to some extent, but you may want to review your notes from Step 1 or your trusty First Aid for Step 1.